The RST Vibrating Wire Piezometer provides excellent long-term accuracy, stability of readings and reliability under demanding geotechnical conditions. Vibrating Wire Piezometers are the electrical piezometers of choice as the frequency output of VW devices is immune to external electrical noise, and able to tolerate wet wiring common in geotechnical applications. The vibrating wire piezometer senses pressure by means of a metal diaphragm attached to a vibrating wire element. When pressure is applied to the diaphragm, its deflection is sensed by the vibrating wire element – i.e. the tension in the wire is reduced, and the resonant frequency of the vibrating wire is changed as a result. The vibrating wire is induced to vibrate, and then the resonant frequency is measured via an electromagnetic coil circuit. The resulting frequency is precisely related to the pressure. The frequency signal is exceptionally immune from cable effects, including length (to several kilometers), splicing, resistance, noise pickup, and moisture. The vibrating wire coil circuit contains no semiconductor devices and has built-in ionized gas discharge device protection against transient damage. As a result, the vibrating wire piezometer provides excellent reliability in typical geotechnical situations – i.e. long outdoor cables buried in saturated soil. The piezometer is equipped with a standard sintered stainless steel porous filter to prevent soil particles from contacting the diaphragm. 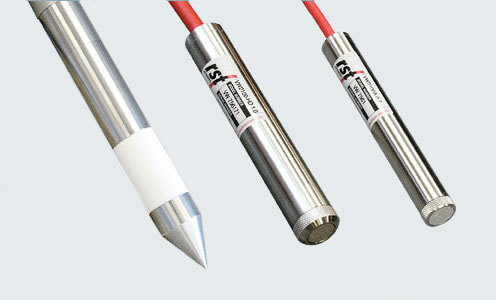 A thermistor is built into the piezometer body to permit temperature measurement and temperature compensation of the piezometer. Standard construction is all stainless steel. RST vibrating wire piezometers are shipped with extremely tough polyurethane-jacketed foil-shielded cable for maximum endurance in field conditions. Field proven reliability and accuracy. Will tolerate wet wiring common in geotechncial applications. Immune from external electrical noise. Signal transmission of several kilometers. Cable lengths may be changed without affecting the calibration. High accuracy, IE a low pressure vented model will measure water level changes as small as 0.5 mm (0.02 in.). Thermistor for temperature measurement is standard. Negligible displacement of pore water during the measurement process. Hermetically sealed, stainless steel construction. Heavy case to minimize reading errors caused by overburden pressure. Assessing performance and investigating stability of earth fill dams and embankments. Monitoring water levels in wells and standpipes. Monitoring pressures behind retaining walls and diaphragm walls. Monitoring pore pressures during fill or excavation. Monitoring pore pressure in land reclamation applications.